In a post examining the causes of the decline in manufacturing employment over the past fifty years, I concluded, like other analysts, that although increases in imported manufactured products had caused part of the decrease, most of the drop resulted from productivity increases from automation and process improvements. See for example: https://www.nytimes.com/2016/12/21/upshot/the-long-term-jobs-killer-is-not-china-its-automation.html. automatable (i.e., probability of automation of over 70%).” But, the impact of automation appears to be slowing. Manufacturing productivity growth has stagnated since the recession of 2008-10. On the surface, measuring worker productivity would seem to be simple since the definition of productivity is output per work hour, and the Department of Commerce’s Bureau of Economic Analysis provides information about employment and industry output. Many of the analyses of the decline of manufacturing employment, including mine, looked at the inflation adjusted value of manufactured products over time and compared that with the number of workers employed in manufacturing them. When they discovered that the value of output per worker had increased, they attributed the change to increases in productivity. Instead, Houseman shows that the output of products per worker in manufacturing, except for the computer industry, has grown at about the same rate as the overall economy. The growth of the value of manufacturing output as measured by the Bureau of Economic Analysis is associated with product quality improvements, not increases in the volume of products manufactured. The chart below, which illustrate’s Houseman’s point, is from “Trade vs. 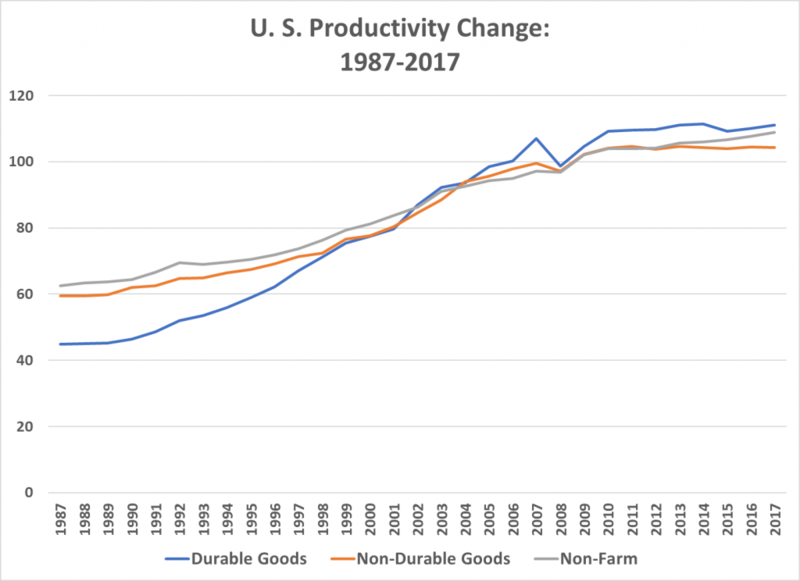 Productivity: What Caused U. S. Manufacturing’s Decline and How to Revive It,” by Adams Nagar, Information Technology and Innovation Foundation, February, 2017. 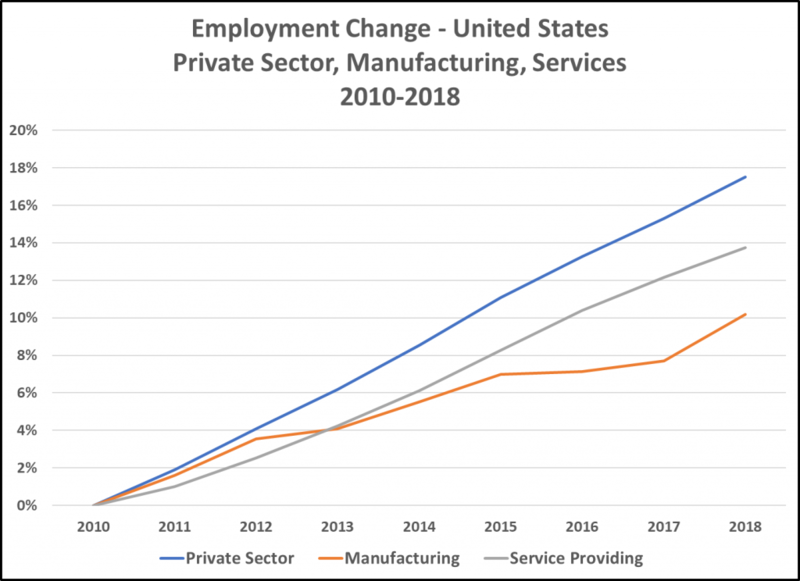 The last eight years have seen a cyclical recovery in manufacturing employment that has been weaker than the employment recovery in service providing industries, with the largest increase coming from the recovery of the auto industry after the Federal bailout. Manufacturing employment has grown overall by 10.2%. Motor vehicle manufacturing employment grew by 47%. During the same period, private sector growth in the United States has been 17.5%. To date, the Trump administration has focused on business tax reductions and tariff policy to encourage employment growth. The stimulative effects of the tax policy changes are likely to support continuation of the post recession recovery, but will confront monetary policy restraint from the Federal Reserve as inflationary pressures build. A discussion of the administration’s tariff approach is beyond the scope of this research, but it carries significant risks associated with the possible growth of trade wars, as well as trade-offs from higher prices for imported goods. The loss of manufacturing employment has damaged to the economy, particularly for workers with low educational attainment and few job skills, since jobs with few educational and skill requirements in the service sector generally pay less. Since it is clear that imports have played a major role in the decline of manufacturing in the United States, policies that help manufacturers are appropriate responses at the federal, state and local levels. Among the more significant options available at the state and local level are support for skills training, manufacturing process improvement assistance from programs like the Manufacturing Extension Program, programs to encourage technology transfer and commercialization, and those to encourage entrepreneurship. Additionally, streamlined regulatory and permit processes can help manufacturers seeking to locate or expand. But, it should also be understood that manufacturing employment is a small percentage of total employment, and that government policy responses will not fully erase the significant wage differentials that have led manufacturers to produce their products outside the United States. For that reason, rational economic development policies should also focus on encouraging the growth of service sector industries.